“The Sundering” series of Forgotten Realms novels, small, personal stories detailing times of upheavals in the shared universe, continue to entertain me and surprise me with their successful range of style and subject matter. For a shared fantasy universe based on role-playing games. certainly ‘light fiction’ that not everyone would take seriously, these have each been impressive. I am again glad for this discovery of Forgotten Realms works beyond Salvatore’s. LIke Salvatore, Denning is well-known for his Forgotten Realms novels, and certainly also for his Star Wars novels. Yet, I don’t think I’ve ever read Denning prior to this. What struck me about his style in “The Sentinel” is how cinematic the writing feels. When adapting written word for screen, much needs to be cut to keep the action moving, the essential details still provided, but able to fit into a short period of time of a film or TV episode. Denning manages to convey this sense of urgent story telling here. The novel immediately breaks out in mid action, a fight and a chase that quickly turns into the mad race/quest that becomes the plot of the story. Denning writes the action very well, believably, providing detail while still maintaining that quick economic pace of words and sentence flow. Amid the continuous drive forward of the novel, Denning still manages to put in moments of character introspection and interaction focusing on the emotions behind their lives, their decisions, or what may be more apt to say, their destinies. While some of the characters aren’t developed beyond their immediate role, the key characters of Kleef and Lady Arietta are rendered suitably complex for the size, scope, and style of this novel. What I particularly liked about “The Sentinel” was how closely the style of its writing matched the overall theme in the story. 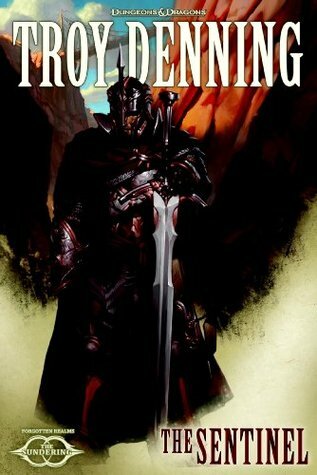 Each novel of “The Sundering” series has dealt with ‘Chosens’ of various gods, serving almost as avatars of a divine battle in the material realm of Forgotten Realms. “The Sentinel”, however, is the first to fully dive into this concept of being a Chosen of a god, of having your life not necessarily be about your ‘choices’ as much as your ‘destiny’, what you need to do, what the gods are driving you toward. Denning’s novel thus becomes the closest to a Forgotten Realms version of mythology that I have yet seen, reading in parts not unlike the themes of Homer’s “Iliad”. The quick nature of the writing, and the constant propelling of action forward, starting characters mid-adventure and going head-forward towards the denouement parallel this theme of mythology so effectively. Characters have few moments to deeply consider or choose what they are going to do, they are being driven by an author, the particular god they worship and have committed to, imbued with the powers and responsibilities of being Chosen. The plot of “The Sentinel” thus becomes rather simple, a straight-forward quest with few major complications, unlike some of the previous entries to the series. Yet, here that deficiency of a clichéd, simple plot doesn’t play as being all terrible because of this successful merging of style and theme by Denning, simply taking the focus of this story onto something more Classic, fantasy back to its roots of mythology with a modern twist.